Euroleague Basketball is pleased to announce Bojan Dubljevic of Valencia Basket as the fifth annual winner of the Eurocup Rising Star Trophy. 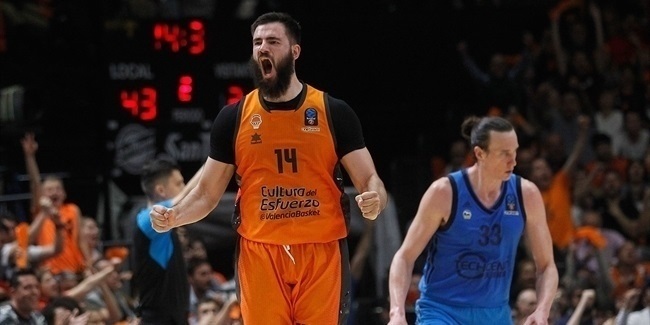 The 21-year-old big man was chosen to the All-Eurocup second team in 2011-12 and comes off an equally solid season for semifinalist Valencia. The Eurocup Rising Star Trophy recognizes the most outstanding player in the competition who was younger than 22 on July 1 of the summer before the season started. Dubljevic, who will turn 22 years old on October 24, has played like a true veteran, changing games with his post skills, long-distance shots and overall effectiveness. Despite stepping on court just 21 minutes per night, Dubljevic was Valencia's second-best player in both scoring (13.3 ppg.) and performance index rating (13.7 per game), while ranking first in rebounds (4.8 rpg.) and fouls drawn (3.4 per game). His great contribution to Valencia's long run in the competition make Dubljevic a resounding choice as the 2012-13 Eurocup Rising Star! The Rising Star Trophy is part of an expanded awards structure launched before the 2008-09 season to enhance the recognition of the finest Eurocup players for their efforts on the basketball court throughout the season. Apart from the Eurocup Rising Star, Euroleague Basketball and its in-house experts also select the Eurocup Coach of the Year, the All-Eurocup first and second teams, and the Eurocup MVP. 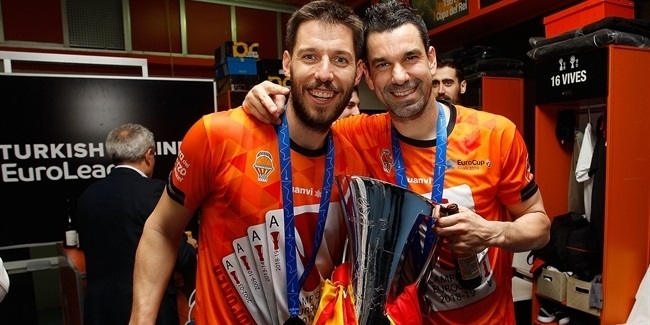 Additionally, the Eurocup Finals MVP award will go the best player at that event as voted by accredited journalists in attendance during the title game. Dubljevic came off a brilliant summer in which he helped the Montenegrin national team go undefeated in the EuroBasket Qualifying Round, winning its group against teams like Serbia, Israel and Estonia. Dubljevic averaged 12.2 points and 6.5 rebounds in 10 games and used his good momentum to shine early in the 2012-13 Eurocup season. He averaged 17.5 points in consecutive games against s. Oliver Baskets Wuerzburg midway through the regular season and finished that phase with a 26-point, 8-rebound effort against BC Azovmash, amassing a 33 performance index rating (PIR). Once in the Last 16, Dubljevic kept doing well despite wearing a face mask for several games. He had 19 points to lead Valencia to a tough 77-82 victory against Nymburk and added 14 points and 9 rebounds to get his team past VEF Riga at home. 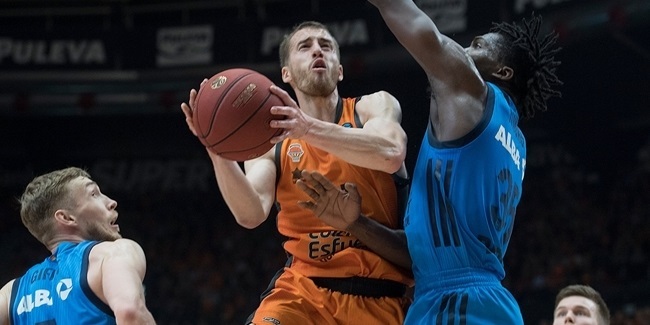 Valencia had to go to Riga in Top 16 Game 5 knowing that a loss against VEF would send it out of the competition. Valencia rallied from a 22-point deficit and Dubljevic was instrumental to that come-from-behind success with 18 points and 10 rebounds, his first double-double this season. Dubljevic led Valencia with 19 points in an 80-70 win against Unics in Game 1 of the quarterfinals. His most epic moment, however, came in Game 2 of the semifinals. With Justin Doellman, Flo Pietrus, Vitor Faverani and Serhiy Lishchuk - all of his frontcourt teammates - out with injuries, Dubljevic stepped up against Lokomotiv Kuban in Krasnodar, allowing Valencia to tie the series, erasing a 10-point deficit from Game 1, with 5 minutes left. Lokomotiv eventually advanced, but Dubljevic shined with 14 points and 11 rebounds as Valencia won that game, even though its season ended. Dubljevic joins Victor Claver of Power Electronics Valencia, Milan Macvan of Hemofarm Vrsac, Donatas Motiejunas of Benetton Basket Bwin and Jonas Valanciunas of Lietuvos Rytas on the list of player to win the prestigious Eurocup Rising Star Trophy. Dubljevic's Eurocup season is finished just one game before the final, but with a long career ahead of him, his potential and talent make him and Valencia a long-term threat together in any competition they play.